Carrying on round the outer bailey of Osaka Castle, in the south-east is a Shinto Shrine called Hokoku Shrine (豊國神社; Hōkoku-jinja). 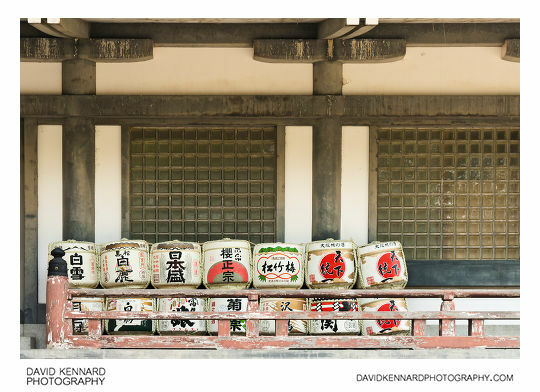 Piled up on one of the sides of the main shrine building were some Sake barrels, known as komodaru (菰樽). Sake, an alcoholic drink made from fermenting rice, is used in some ceremonies at Shinto shrines. Sake breweries will donate barrels of Sake to the shrines for use at these ceremonies. The used komodaru will often be left piled up where they can be seen by visitors to the shrine. As the sake breweries put their names on the barrels, this acts as a form of advertising for the breweries. 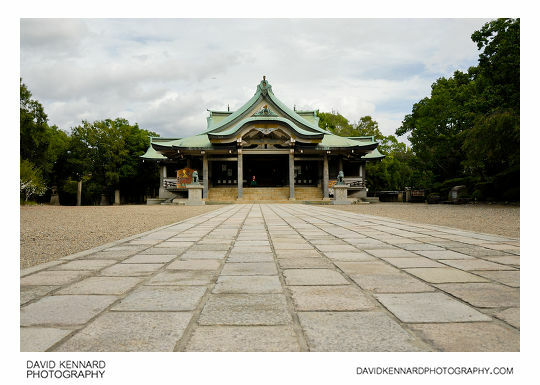 This is the main building of Hōkoku jinja. The large wooden sign with a picture of a bull on it shows the design of the Ema (絵馬) small wooden prayer plaques that can be bought and hung up at the shrine. On the right you might notice the man has a mask over his mouth. In both Korea and Japan there were people wearing these face masks, particularly on the trains. I'm not sure why, but I'm guessing they were trying to avoid catching swine flu, which there was a lot of media attention around at the time. 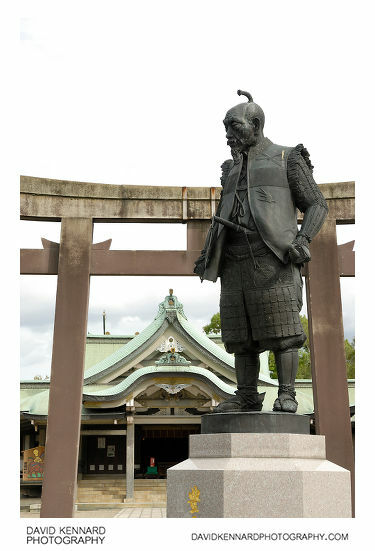 Hōkoku shrine is dedicated to Toyotomi Hideyoshi - the founder of Osaka Castle, his half-brother Toyotomi Hidenaga, and his son Toyotomi Hideyori. They are worshipped as spirits of success and fortune. 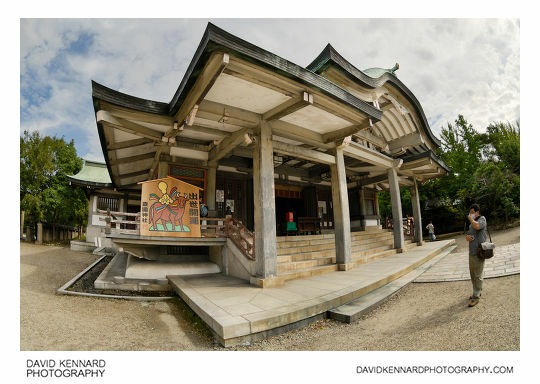 The shrine has been moved about a bit during its life - it was originally built in 1879 on the orders of Emperor Meji, and at was constructed at Nakanoshima Azayamazaki-no-hana, the current location of the Osaka Central Public Hall. Later it was moved near to the Osaka Prefectural Nakanoshima Library, then was finally moved to its current location in 1961. Round the back of the shrine is this small rock garden (秀石庭; Shūsekitei). The garden was created in 1972, and is themed on the ocean, representing the prosperity of Osaka, which faces the ocean. 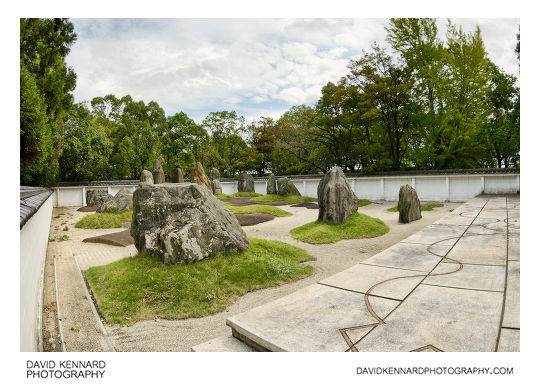 The shape of the garden is based on a Sennari gourd (千成瓢箪; Sennari hyōtan), which Hideyoshi used as his battle flag insignia (Uma-jirushi; 馬印). You can't see that very well from this shot, and you couldn't go into the garden to get a better shot, but the aerial view on google maps shows it a bit better. The large stones used in Shūsekitei represent Ishiyama (石山), the name of the location where the shrine and Osaka castle are built. 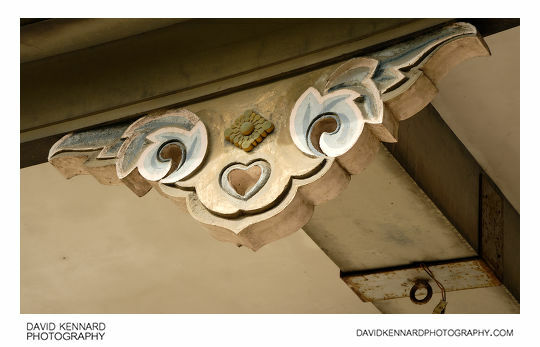 Above photo is of one of the ornaments at the end of a roof beam. 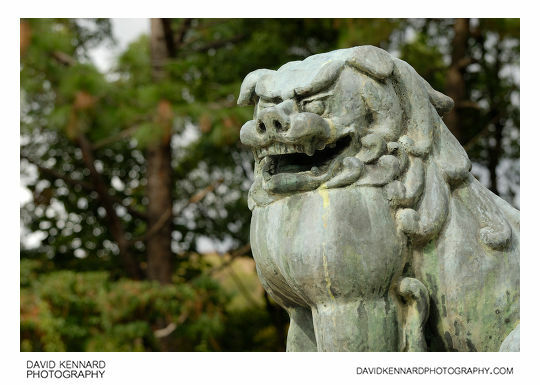 At the front of the main building are a couple of bronze Komainu (狛犬) or shishi (獅子) guardian lion statues. 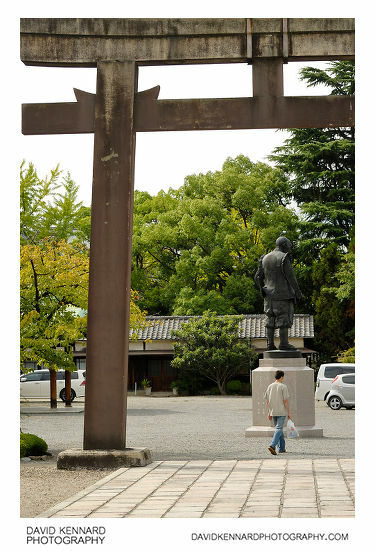 Opposite the main building of the shrine is a large concrete torii (鳥居) gate and a statue of Toyotomi Hideyoshi. 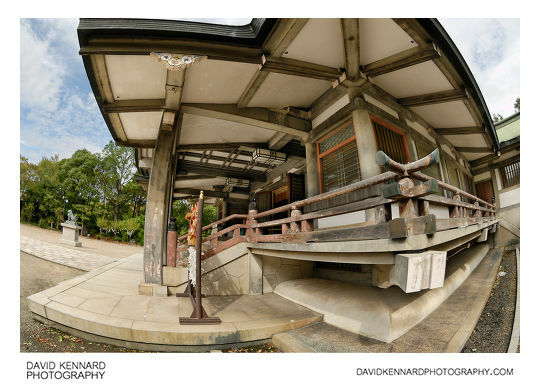 The above photos show the front of Hokoku shrine's man building. This is the nicely detailed statue of Toyotomi Hideyoshi, who united Japan under himself, built Osaka Castle, and the shrine is dedicated to. It is a recreation of an earlier statue that was destroyed during WWII. The new statue was completed in 2007 and was created by the Japanese sculptor Nakamura Shinya (中村晋也). It is 5.2m high in total - the statue is 3.2m high and the pedestal is 2m. David, Very nice photos & explanations to go with them, well done. 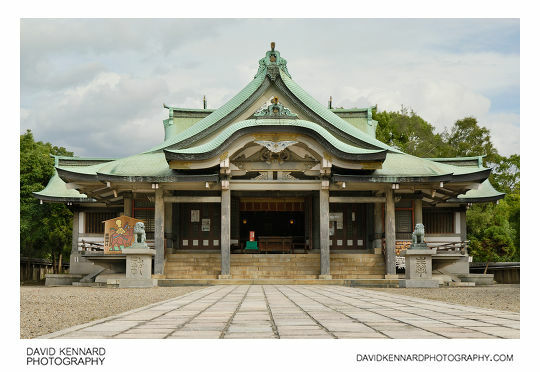 I was wondering what the statues of the 3 ladies in front of this shrine were & what they represented, do you know? Thanks for the kind comment. I’m afraid it’s quite some time since I was there, and I can’t remember the statues of 3 ladies. Do you have a photo of them at all (or can you find a photo of them on the web)? It might jog my memory a bit.